Whether you call it grilling, barbecuing, smoking or something else entirely, you can’t go wrong using these simple grilling tips to master your pellet grill. Keep notes: The best way to keep track of your favorite dishes and the ones that flop is simply writing them down. Keep a notebook with some of your own personal favorites. Without your notes, you could end up making the same mistake multiple times. 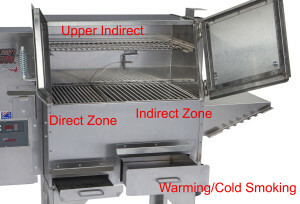 Learn how to use your zones: Zone cooking allows for maximum use of your pellet grill without a ton of additional space. Some foods, like steak, taste great when slow smoked but just aren’t the same without sear marks. Zone cooking gives you the best of both worlds! Flavor inside and out: There are so many ways to add flavor to your recipes with rubs, sauces, seasonings, brining, marinating or injecting, and you don’t have to stick to just one! We like to inject our chicken, use a dry rub on it and serve it with barbecue sauce. Internal temperature is key: A recipe may say it takes 4 hours at 225°F, but when you pull it off the grill it’s overdone. Either keep a good eye on your food while it’s cooking or use a meat thermometer to gauge the internal temperature of what you’re cooking. The USDA recommends certain internal temperatures for different cuts of meats. Rest: Allowing your meats to rest after grilling causes the juices to redistribute evenly after being on the grill. This redistribution keeps food moist and flavorful. Let your grill season: You grill is kind of like a cast iron skillet, the more you use it, the better food tastes coming out of it. We recommend scraping and cleaning out your grill when you see buildup, but extensive cleaning with heavy chemicals can make your next few cooks taste awful. Good luck and let us know if you have any grilling tips or tricks we missed!